Is there any reason (code or otherwise) to not vent one room into another? I have a closet in my office that I'm using as a server room in my house. As I add more equipment in there, it generates a significant amount of heat, which is contributed to by the office itself (which has two computers). My living room, on the other hand, with a seldom-used fireplace and large older window (both issues I plan to address in the future), tends to get very cold in the winter (US/Massachusetts). It seems to me the obvious solution would be to put a small fan in the ceiling of the closet (where convection will naturally carry most of the heat), and put a duct in the attic crawlspace that exhausts into the living room. It may not contribute a whole lot of heat to the (much larger) living room, but if I can drop the office temperature by 2-3 degrees and raise the living room temperature even half a degree or so, it'd reduce the temperature gradient just a wee bit and maybe said gradient wouldn't be quite so noticeable when I leave the office and go into the living room. Is there any reason I shouldn't do this? Please note that my primary concern is eliminating heat from the closet (as we all hopefully know, electronics don't really like getting too hot). Reducing temperature in the office would just be a happy side effect, and I figure dumping the heat into the living room is more efficient than just dumping it outside since I've already paid for the electricity that produced it. Below is a diagram of the relevant areas. I'd like to avoid having the air blow on the armchair area (there are actually two along that wall)... I would like to vent the hot air more or less into the center of the room so it's not blowing on anyone who's seated. 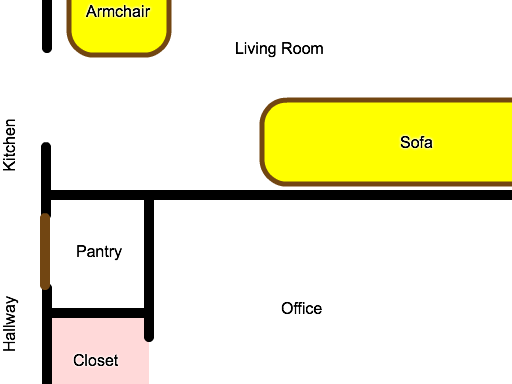 I was thinking a louvered vent above the sofa's front edge (about 2-3 feet in from the wall), pointing inward to the room, would dump the heat into the living room without creating drafts for anyone in the seating areas. There is no code against ventilating your closet into the other room. There are all kinds of crazy things I have seen to take a room that has great ventilation and move it to another room. If you go in the south of France you will see fans between the living space that has outdoor access in the connecting rooms. The only issue becomes if you had toxic fumes (which you wouldn't in another interior room) and this is common with a work area or garage (cars). As far as going through the attic well attic fans exhaust attic air into your living space and attic air probably isn't as clean as the other air you are breathing as attics often have mold, dirt, and open insulation. You are just tunneling through using appropriate piping which should be metal ducting or PVC. Let me tell you why what you are doing is a good idea - since we should all look to make our houses energy optimal - but very flawed at the same time. It is flawed because during the periods of the year that are cold and you want the next room warm you will be going through a cold attic. The output of whatever your server generate is no way a furnace, the ducts will get cold and you will end up spitting out cold attic temperature air to the next room. The fact is the fan plus cold air will cost you energy money. Really you want to just vent right to the attic when it is warm out. When it is cold out you want to vent right to the other room. You could do this with decorative grating/cover between the rooms and possibly the use of a fan in the grate itself. There are probably a lot of unique ways to create airflow between the rooms, with pipe/duct being an option but not an efficient one as it will not necessarily capture all of the heat and if it does will require a lot of power from a fan. Nothing wrong with using a fan but it shouldn't need to be on all the time and shouldn't need to require that much force. Excellent idea. We do that (move "waste heat") in commercial buildings. However, be careful to: 1) verify no smells are being transferred, 2) make-up air is provided to the computer room, 3) transfer duct is insulated so not to loose all the heat out the duct, 4) keep transfer duct on "room side" of insulation envelope, and 5) don't let the transfer duct's grille blow heat on living room's thermostat...or any thermostat. 1): Smells can come from the closet or adjoining office. Be aware of what's left in the room. We found cleaning supplies in a computer room once when a client complained. 2): Make up air is important because your fan can push the air if it can't get more air to come into the room. Maybe provide a duct from the living room for the make-up air. 3): If the distance is very great, you'll loose all the heat out the duct before it gets to your living room. Consider adding duct insulation. 4): An easy way to transfer most of the heat is to keep the duct on the room side of the insulation. Maybe consider running the duct in the attic rather than crawl space where it's easier to move the attic insulation on top of the duct. 5): Make sure the transfer duct grille does not blow on the living room's thermostat. We like to locate grills by windows to temper the colder air you often find there and eliminate condensation. However, now with thermal pane windows that's not so important anymore. By the way, you may want to locate the thermostat that turns the computer closet fan on, in the closet...not in the living room. One side benefit is keeping your computers cooler so they run better. Note: The only Code issue you have to worry about in a residence is the wall between the garage and the house. You can't penetrate it without a 1-hour fire damper. I would consider adding a bank of fans, (3) 6" fans maybe, mounted in the wall above the sofa as close to the ceiling as possible. They would pull air from the office into the living room. Then add a bank of fans at the top of the closet wall to pull air from the closet into the office. I would also add a normal ceiling vent fan like used in a bathroom in the top of the closet to vent heat into the attic during warm months. Use movable louvered grates over the exhaust side of the fans so air can be directed to fall closer or farther from the wall as desired. Since hot air rises, if you can draw the warm air exiting the closet, across the office ceiling and into the living room fast enough, you'll get some benefit In the living room. Otherwise, the office will just stay toasty. The loss of warm air into the office due to it starting to fall as it cools could be eliminated by later adding an in-room duct along the ceiling from the closet fans to the living room fans if necessary. Curve it if possible so it's more stylish and moves air easier. Note that turning on a ceiling fan in the office would direct all the closet heat into the office instead. None would reach the living room unless it's ducted. Not the answer you're looking for? Browse other questions tagged code-compliance ventilation temperature or ask your own question. Why not put a vent that pushes air from the attic into house? Another code question: can I take a 110V outlet off one leg of a 220V circuit? Is there any code regarding in-wall convection ovens?